Welcome to the fourth Seance25 newsletter of the harryprice.co.uk website. Better late than never is the subtitle of this issue as it has been a bit delayed due to my finishing off some large additions to the site which I wanted to include here. I am also in the process of moving house which hasn’t helped and also resulted in the cancellation of a trip to Borley with Eddie Brazil a week or so back which was to be featured in this issue, but we’ll get back there in due course. As always comments on the site and this newsletter are welcomed on the usual mailbox@harryprice.co.uk e-mail. I would like to start off by thanking all those people who have been in touch. Paranormal investigator Derek Green of the Ghost Club has added a link to HP from their site. Derek is actively involved in several investigations of allegedly haunted sites and has his own website Scottish Ghosts which is well worth a look. Thomas Jones of the International Survivalist Society has added a permanent link on his site for which I’m also very grateful. Another Ghost Club member who has been in touch is Dean White who through ‘Final Analysis’ author Edward Babbs has obtained a lot of Borley material from Tony Broughall which he has kindly said can be included on the site. Thanks also go to veteran SPR member William Fisher who kindly sent through photographs of the interior of Borley church which will be included in a proposed essay for the website on the architectural and ghostly history of that building by Eddie Brazil. Andrew Parry sent through information on Harry Price’s Christmas Ghosts, probably the rarest of Price’s books which will be added to the Books by Price page in due course. I am also very pleased to have been in touch with Richard Lee Van den Daele who those familiar with the Borley Rectory case will know of through his tracking down of Capt. Gregson's sons which was reported by the late Ivan Banks in his book The Enigma of Borley Rectory. Richard has very kindly agreed for me to reproduce photographs of Borley from his personal collection and has also supplied some great photographs of the north-east elevation of the Rectory which were taken by Sidney Glanville in 1937 which are now included on the Gallery page. The past month has really been a Borley Rectory month as this section of the website has seen some sizeable additions. The following is a resume of the new Borley-related material which has been included. I am really pleased to have added Eddie Brazil’s essay on M.R. James and Borley to the site. Eddie has been a fan of James’ fiction for a long time and presents a convincing case for the master of the English ghost story visiting the site of ‘the most haunted house in England’. Eddie reasons that James' love of church architecture and his familiarity of the area would have drawn him to Borley and the area may well have provided the background for one of his most famous tales, the chilling Count Magnus. As mentioned in last months newsletter, Sidney Glanville's 'Locked Book' report compiled following his year long involvement in Harry Price's tenancy of Borley Rectory is now online with the addition of over 150 webpages to the site! Copies of Glanville's original typescript comprising correspondence, photographs and tracings of the notorious wall-writings, which was presented to Price and subsequently used by the great man to write The Most Haunted House in England can now be viewed in their original form. The Price at Borley section, which will chart Harry Price's complete involvement with his most famous case is now online. 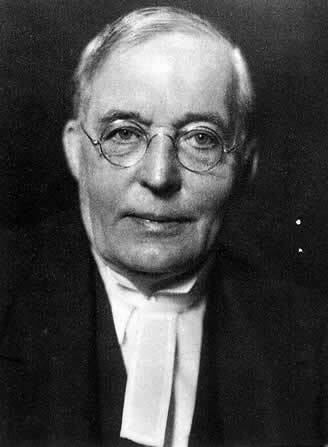 As with other sections of the site the intention is to contrast Price's own writings on the Borley story with those of his contemporaries, critics and modern authors. As such there are now online versions of the Borley chapters from Confessions of a Ghost-Hunter and Poltergeist Over England, together with Dr Paul Tabori's contribution from his 1950 biography of Price. 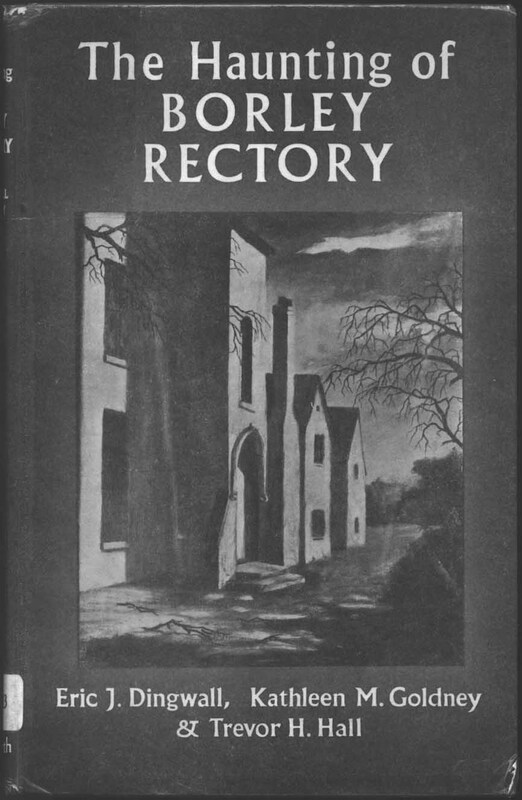 I have now just finished adding a major complete book to this section - the controversial 'Borley Report' comissioned by the Society for Psychical Research and published as The Haunting of Borley Rectory - A Critical Examination of the Evidence by Dingwall, Goldney & Hall can now be viewed in its entirety. To be fair to Harry, I have also added Robert Hastings' response to HBR which was published in the Proceedings of the SPR in 1969 in which the author takes the former trio of authors to task in several aspects of their investigation of the case, together with an earlier critique of the 'Borley Report' by another SPR member Michael Coleman. 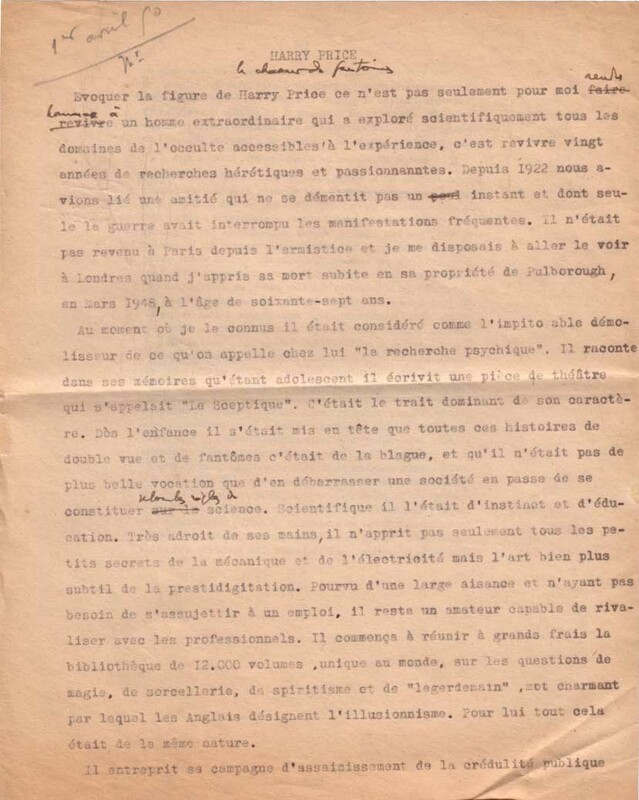 In the coming month I will be adding some more things from my own Price collection onto the site which includes material from the former library of René Sudre, the French psychical researcher with whom Harry Price remained on friendly terms right up until his death. In 1950, Dr Paul Tabori asked Sudre to write an essay on Price which together with reminiscences by others such as Sidney Glanville and C.E.M. Joad, formed part of his Harry Price: The Biography of a Ghost Hunter. Sudre's contribution was heavily edited and is a bare two pages in the published book. Opposite is the first page of Sudre's original hand-corrected 18-page draft which is in the process of being translated and will soon be on the site. As far as I am aware, this will be the first time that the complete essay has been published, although Sudre may well have recycled it in other publications - if anyone knows I'd appreciate an e-mail! Price's 1936 book on the notorious 'Talking Mongoose' case attracted fierce bidding on eBay last month. 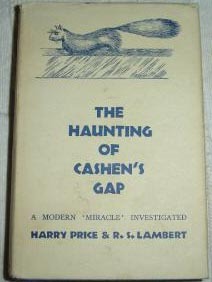 One of Price's now rarer titles which appears from time to time, this copy of The Haunting of Cashen's Gap which Price co-authored with R.S. Lambert, went for a whopping £150. This is the first time I have seen a copy in the original dust-jacket which no doubt added interest to the auction. I 'borrowed' the image on the auction page for the site as it turned out to be much less expensive! I have now added scans of some more titles to the Books by Price page. 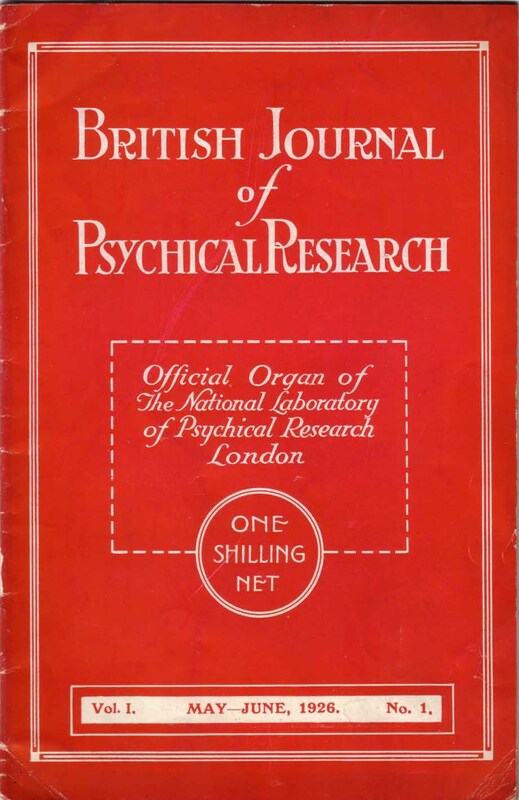 There are now covers of Volume 1 of the Proceedings of the National Laboratory of Psychical Research which is the report into the Eleonore Zugun investigation, the 1935 Supplement to the Short-Title Catalogue of Price's library, Bulletin II of the ULCPI which covers the fire-walking experiments with Kuda Bux and finally the French translation of the Stella C séances prepared by René Sudre. That's about all for this update for Harryprice.co.uk. The Séance Room section of the website will be brought online in the coming month with articles on the foundation and publications of the National Laboratory of Psychical Research and the mediumship of the great Rudi Schneider. The next issue issue of the newsletter will probably be out around the middle of next month.